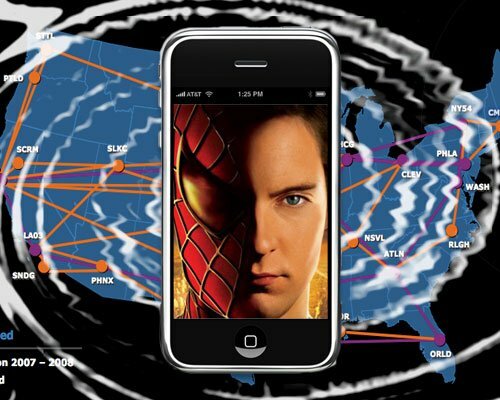 Okay, so technically Apple isn't patenting "Spidey Sense" (TM Marvel Comics, of course), but a system to warn users of impending dropped signals, be they cellular or WiFi. So, by way of example, if I called Steve Jobs to tell him I snapped a pick of the iPhone 3.0 prototype, and Rogers' service began to cut out, I'd get a notification (sound, alert dialog, or vibe) warning me I was going to lose the signal, and on his end, El Jobso would likewise be alerted. If my device happened to have an accelerometer and GPS (hello, iPhone 3G! ), location, velocity, etc. could be weighed into the alert equation. So, if I was driving away from Cupertino at a hurried rate, spy shots in hand, the iPhone could factor that into calculating how long it would be until I lost signal. In a second filing, Apple is also working on a way to find lost, Blue Tooth equipped devices, from currently equipped gear like headsets, to tiny BT enabled chips placed on anything from your keys to your kids. Again, using different data sets like signal strength, the iPhone could figure out which direction and at what distance the missing item (or small human) is located, using helpful cues like volume and frequency of alerts to re-create the classic game of "cold... warm... warmer... hot... on FIRE!" Check the read link for all the official diagrams and verbiage.